A good choice as a lovely gift for your friend / Wife / Mom/ Sister. Add a unique accent to your Earrings collection. 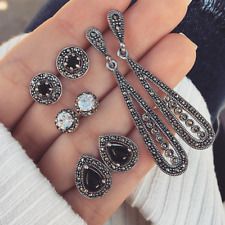 4 Pair/Set of Earrings. Material: Alloy,Crystal. It's a perfect accessory, also a good gift to your friends It will make you beautiful on picture. Material: White Brass, Platinum Plated, AAA Austrian Zircon. Color: Silver. Gift for: Friend / Mum / Wife. It is a good gift for your lover,family,friend and coworkers. Angel Wings Stud Earrings, High Quality. Component: Austrian Crystal & White Brass, 925 Silver, Platinum. Material:Silver Plated. Material: White Brass, Platinum Plated, AAA Austrian Zircon. Color: Silver. Size: 0.9X0.9 cm. Material: Alloy,Crystal. Quantity:4 Pair. Color: Black. Material:Alloy Crystal Zircon. Beautiful and attractive. Beautiful and attractive. Material:Alloy Crystal Zircon. Material : Rhinestone Alloy. Color: As the picture show. Size :As picture. Rate (item arrived). Pictures:Due to the difference between different monitors, the picture may not reflect the actual color of the item. Quantity:4 Pair/Set. Color: Black. Size(about)：As the picture show. You may also like. Type:Clip Earrings. Earring Length: 6.2cm. Earring Width: 1.5cm. 1 Pair Earrings. Weight :7.5g.